So now that I’m unemployed, I’ve decided that I can’t just sit around the house all day. 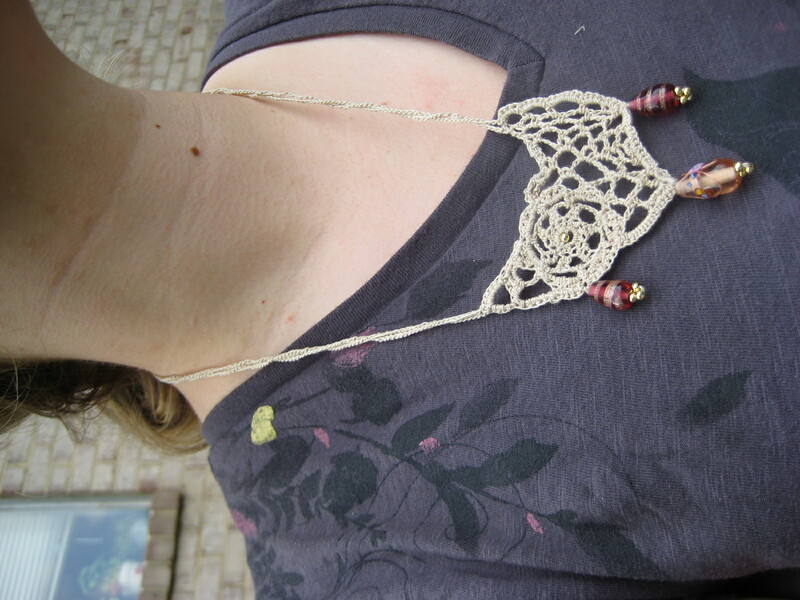 I’ve been working on new designs for lace necklaces recently and I’m ready to see how they fare on the open market…is Etsy an open market? What is an open market? I’d really like to take better pictures of my work. 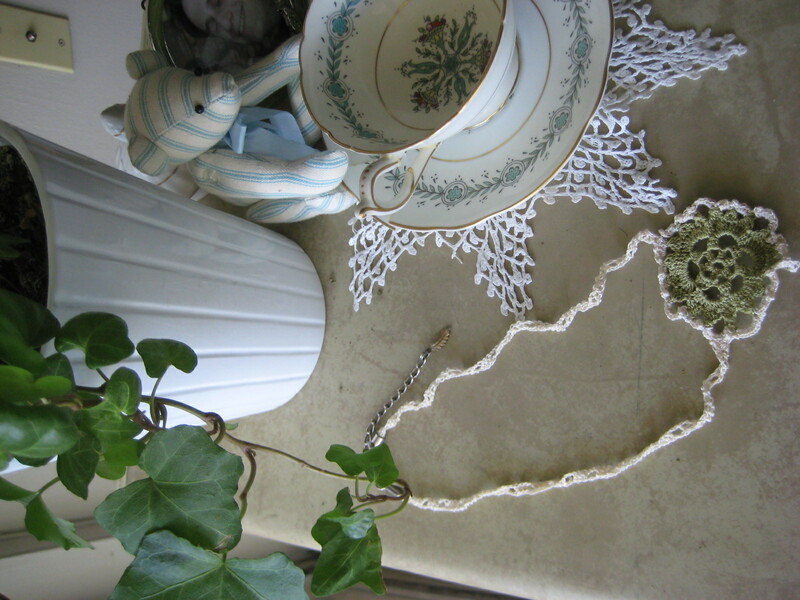 We’ve had nothing but cloudy days for weeks, and I haven’t found a good means of showing off the lace… any ideas? 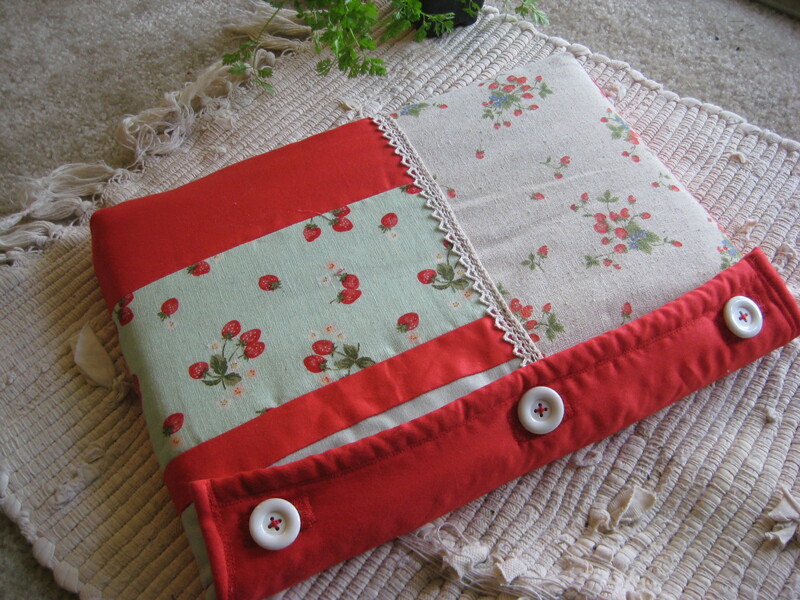 I also made a laptop sleeve which I think is adorable! ^_^ Wish me luck! 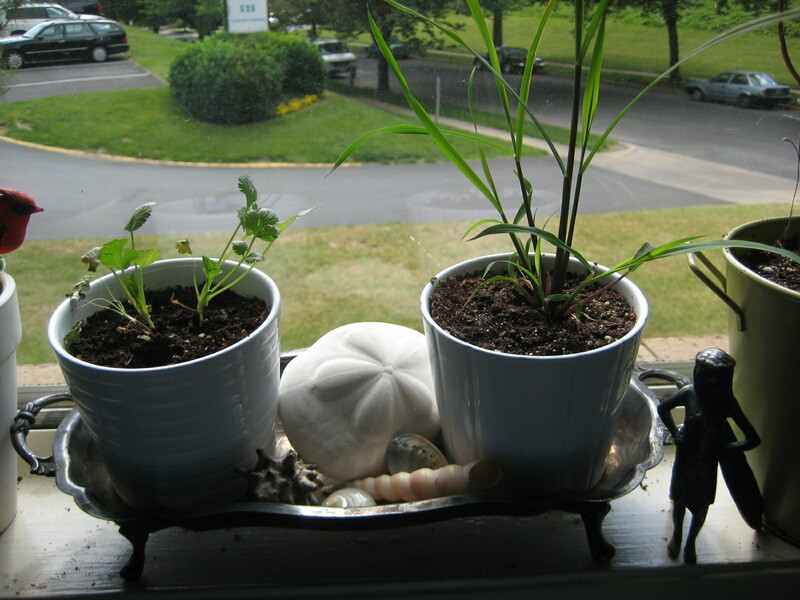 For my birthday my roommate gave me flower pots and seeds for herbs! So did my sister! I was elated!! 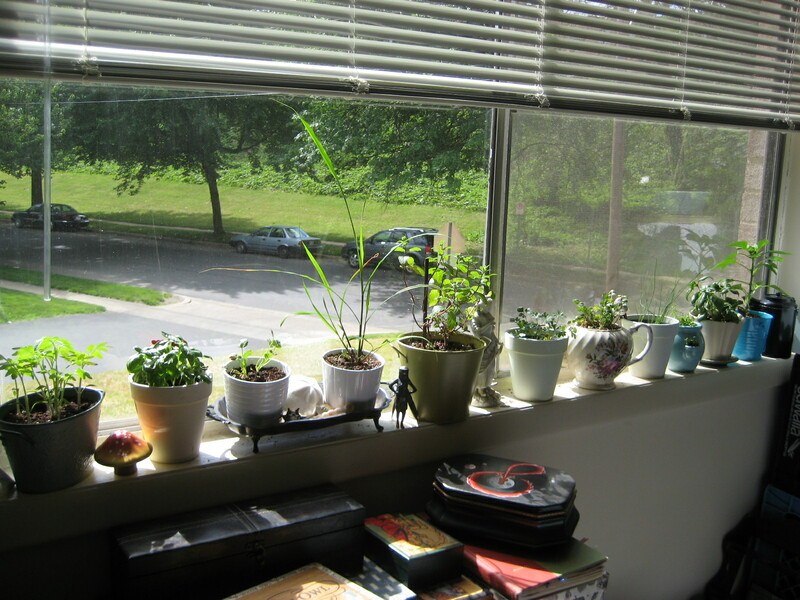 I love that I finally have a windowsill and some light to grow with! 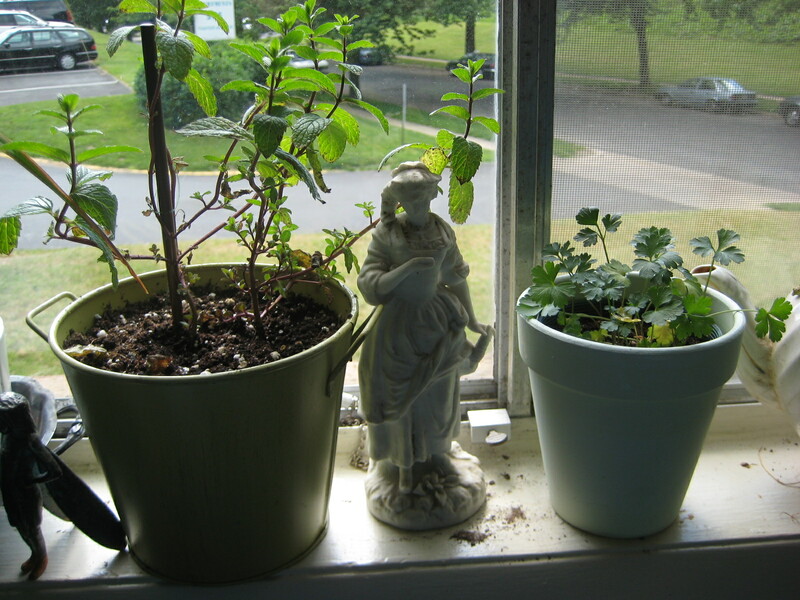 I have cherry tomatoes, yellow peppers, mint, basil, thyme, parsley, cilantro, rosemary, lemon grass, chives, nasturtium, and dill! 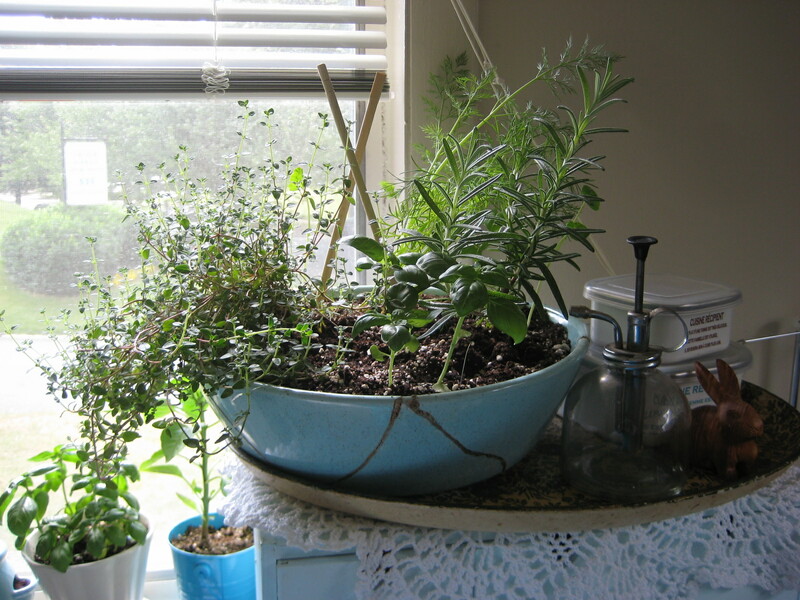 I’m still missing lavender (not of the English variety), aloe, sage, and chocolate mint (yum! ), but I am having a hard time finding these last ones. Also, does anyone have tips on growing cilantro? Mine isn’t doing so well. 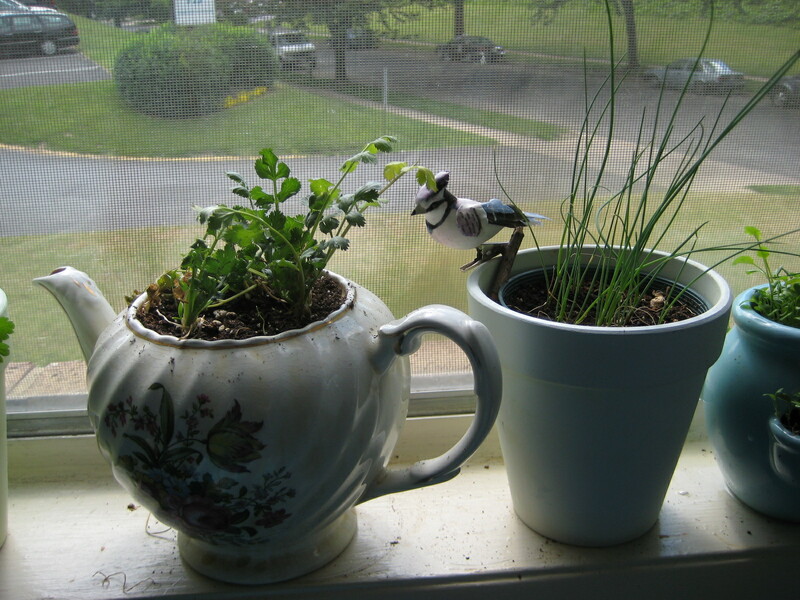 I have two batch of them, and the ones I started from baby plants I potted it in a teapot. They have drainage in the bottom, but they just don’t seem to want to grow back all their legs that I used for cooking my breakfast burritos! Any thoughts? Well, that’s my garden. 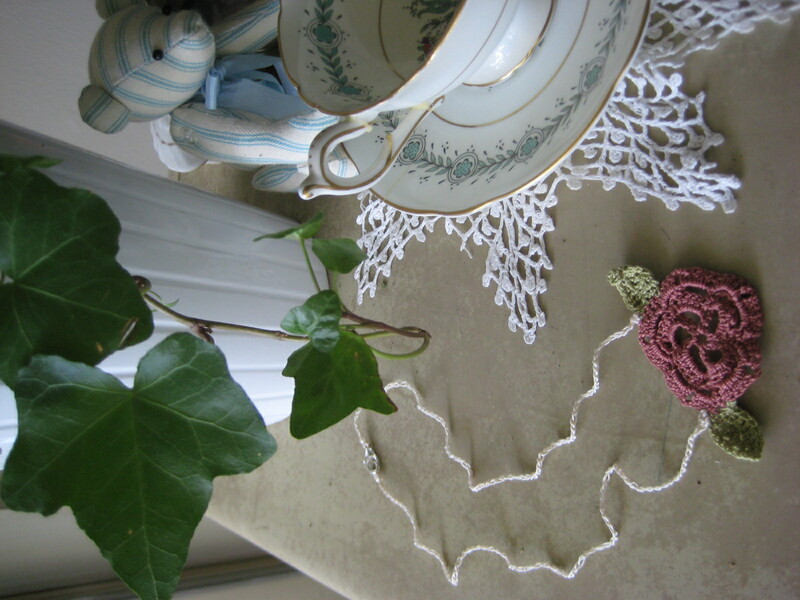 Someday I might get the real deal, but for now… I’ll be content waking up to my pretty green things in the window every morning. What a great way to start my days! Sometimes I dream like Voltaire in Candide, that all a man needs is his garden. Then I wake up in the same world everyone else lives in and realize that while we don’t need a lot of the gadgets and gizmos society wants us to need- some of them have become pretty crucial. The one I’m talking about? The internet. I have been without the internet for 5 months! 5! Count ’em! I haven’t been able to apply for jobs or check email every day or find out when my friends are getting together last minute and post about it on facebook. It was a drag! Not to mention not being able to answer random trivia questions, how to cook certain things, or even how to get from point A to point B. I love you Google maps! Obviously I missed my blog, too. First…. 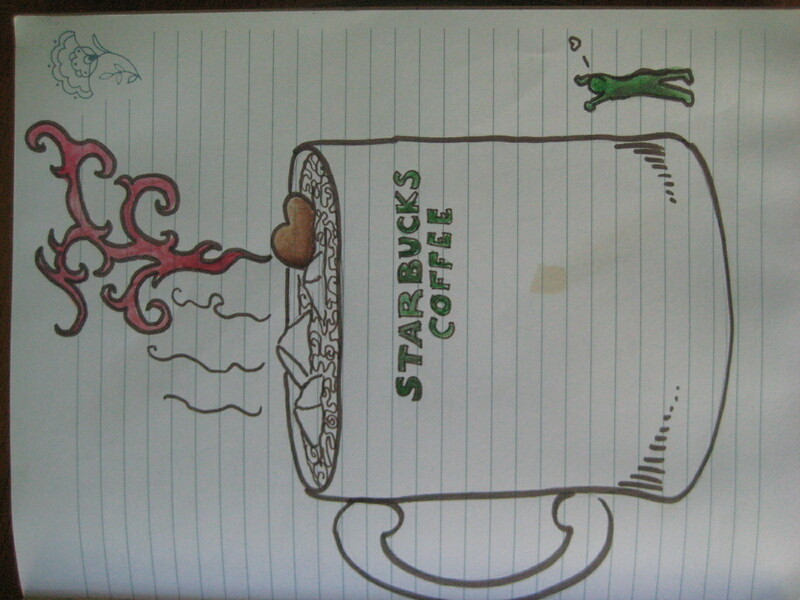 my love goes out to Starbucks who gave me internet access when I really needed it. Thank you! 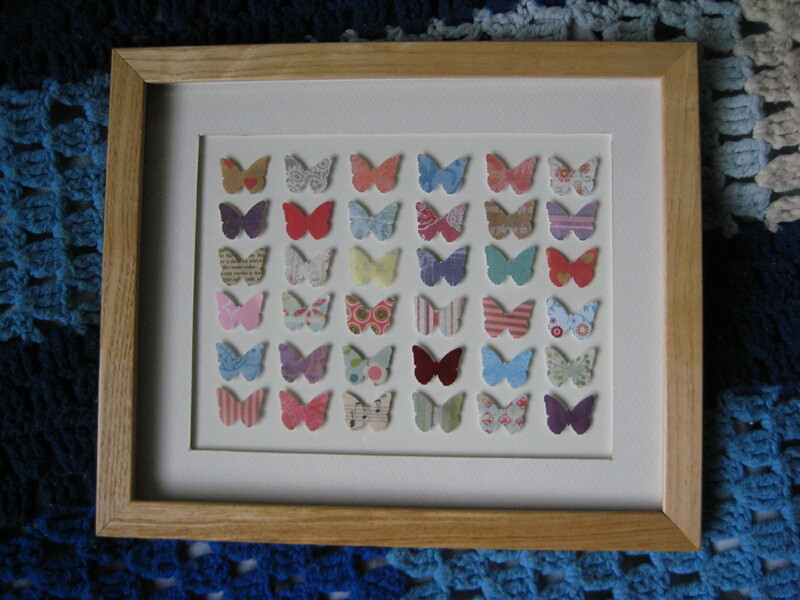 For my niece’s birthday I made a butterfly collage with some of the scrapbook paper I have amassed over the years. The punch is from Martha Stewart, the idea is from Ali Edwards. I got the frame at a thrift store. Whee! 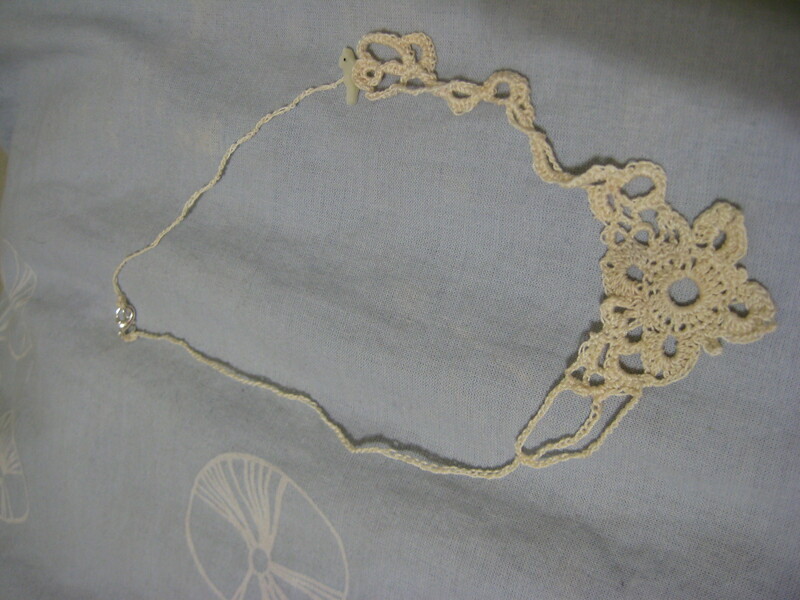 For my mother’s birthday I made a lace necklace… a little more complicated than my first one, but still along the same lines. I like how it parts of it turned out. 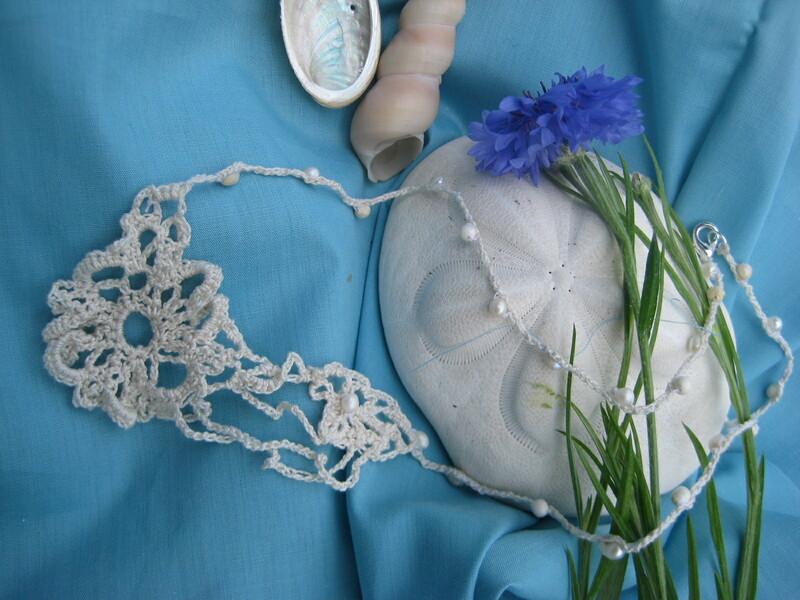 The upper part that looks like a seashell cut in half is my favorite. And for my 2nd niece’s birthday I made a sundress out of a skirt from a thrift store. I love doing this! You find such great prints and you feel awesome recycling instead of buying new yardage. It’s tons cheaper most of the time, too. Well… depending on the thrift store, I guess. I like buying XL mens shirts in stripes. Such fun! 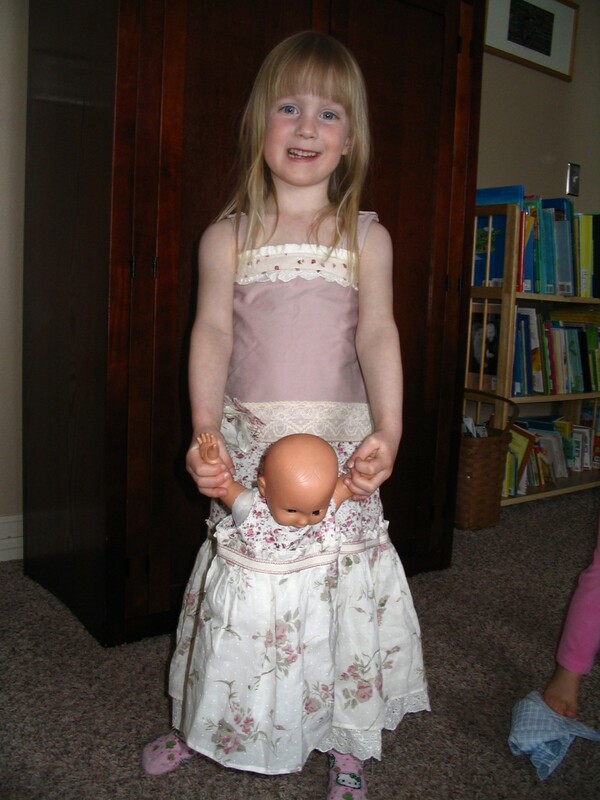 Oh, and I made her favorite doll a matching dress, too. Cause that’s just what a good aunt does. More to come later! I’m glad to be back.